The person who probably contributed more to our understanding of human memory than anyone else was Henry Molaison, who died on December 2, 2008 at the age of 82. No, Molaison wasn’t a neurologist. He was a patient who had both hippocampi surgically removed from his brain in 1953, when he was 27 years old, in an effort to reduce his severe epileptic seizures. Our Blog Now On Line! 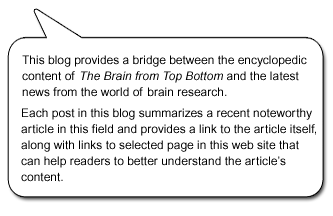 Here it is, The Brain from Top to Bottom blog. And it’s hard to miss, because we’ve built it right into the web site’s home page. Why? Because for us, the blog and the site are now inseparable, interactive parts of a whole, each referring you to the other for more information.